A year ago I decided to show you a taste of what can be picked and eaten from the streets and parks of Amsterdam, every day for a year. That year came to an end today. It has been quite a journey! There was never a day without edible or medicinal herbs growing wild. As the year moved on I found more and more herbs, fell in love with some such as Hollyhock and learned secrets about others. Whilst on holiday, friends in Amsterdam were often kind enough to email photos to me. The Christmas holiday was difficult, Amsterdam had miserable weather so fewer photos from friends. In place, I added a batch from my holiday in Tenerife. I am very grateful to Joop Eisenburger, Lina Kremin, Elodie and Herman den Otter, Dennis Breedijk, Lynne Dunstan-Wadsworth and Dana Marin and others for their beautiful photos, whilst I was away from time to time. So what is around today on day 365? It was an apprenticeship group meeting for me so friends to share the discoveries with. 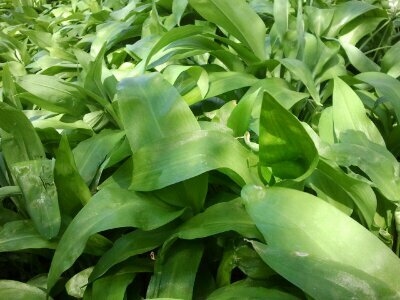 Above is Wild Garlic (Allium ursinum). Just braking into flower in some parts of park Frankendael, this patch is still perfect for the pot. 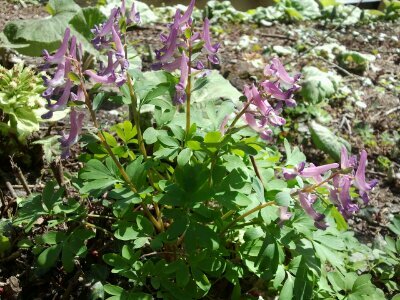 Below, Fumitory. Renowned in some regions as a cleanser of radiation from the body and more well known as a tonic for the digestive system. 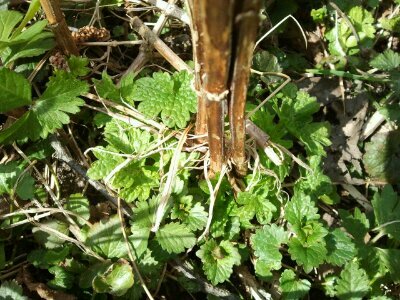 Next is Motherwort (Leonurus cardiaca) NL Hartgespan. Returning from its winter underground hide. Beloved, bitter herb. Here is Pennsylvania Pelitory, I was so pleased to learn of its urinary tonic effect last year. 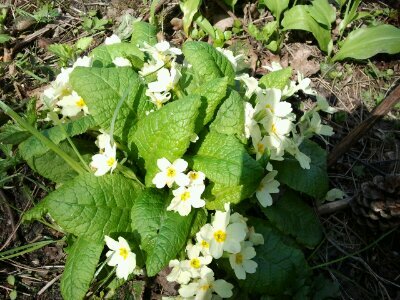 Primrose (Primula vulgaris). 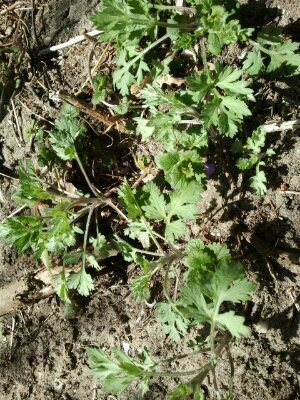 This plant will be focused on in my next project – growing and using native herbs in public (or private) spaces. There is not enough Primrose to pick in Amsterdam, so why not grow some more? Greater Celandine (Chelidonium majus). Orange sap for herpes and dissolving skin growths. So many more uses for this herb but be careful, it is caustic. 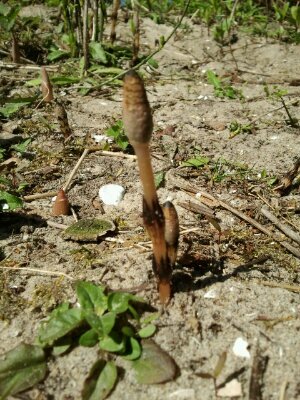 Horsetail (Equistitum arvensum) flowering, ahead of its foliage – so useful for brittle nails due to the high silica content. 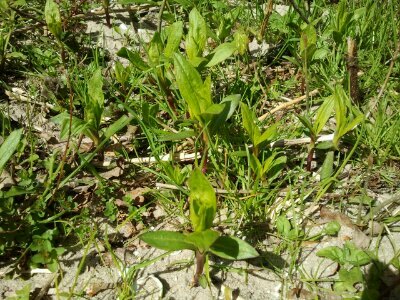 Soapwort, also just emerging from the soil. Still used by some musea to gently cleanse ancient fabrics. It is a wonderful herb for many skin complaints and grows easily in a pot. It’s other common name, Bouncing Bet, aptly describes it’s flowering beauty in summer. 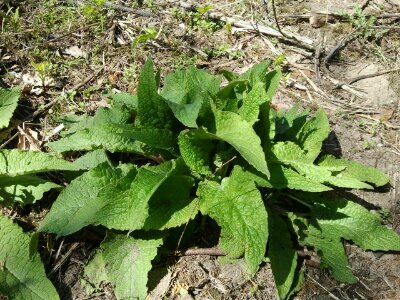 Russian Comfrey (Symphytum uplandicum x). Bone set in old country tales, rapid wound healer and more for us today. 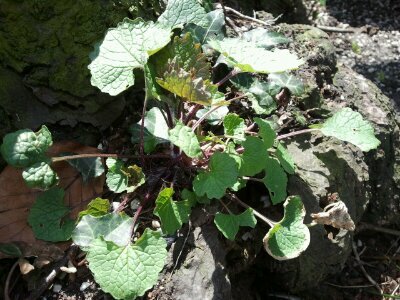 It smells and tastes of Borage and Cucumber, is gooey inside and is so easy to use on your body and your compost heap! I’m so happy to find this plant. Really happy! It is Wormwood (Artemisia absinthum). 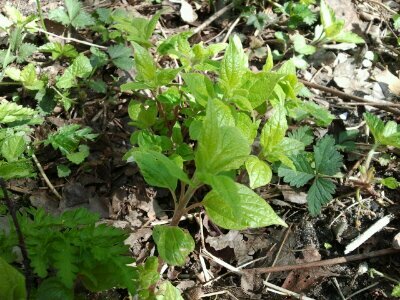 It is an endangered species in the Netherlands, this is the first patch of wild Wormwood I have found in Park Frankendael. 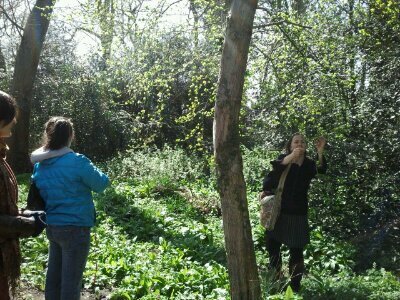 Some of my apprentices gathering Bread & Cheese from a beautiful Hawthorn tree (Crataegus monogyna). May Day here we come! 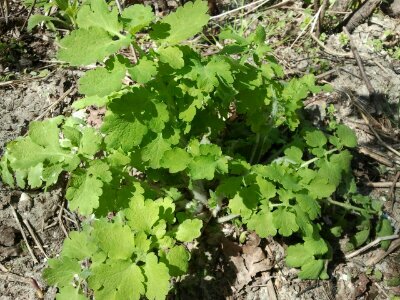 Here is Garlic mustard (Alliaria petiolata). One of the best eating wild plants in town. Pick just a leaf per plant when you find it and it’ll treat you to delicious meals until autumn. Pick a whole plant and you’ll really miss out later on! 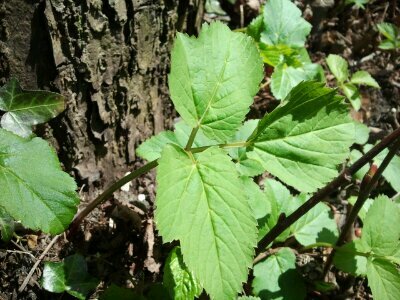 And Ground Elder (Aegopodium podograria). I love this plant but most gardeners try to rid their patch of it. A carrot family member, it tastes of parsley, clears gouty, sciatica and rheumatic joints and I’ll be eating it daily from now until early winter! There were far more plants today but now it’s time to stop. So a beautiful day, a beautiful project (to be continued in some form but not daily), amazing plants on our doorsteps and wonderfully enthusiastic people to share them with. Many thanks to everyone who has been involved on some way and especially Frank for his tolerance. I’ll now have a little rest and then organise the photos into something useful. Also time to finish my book on making remedies. If you’d like to walk with me and learn about the plants to be foraged in Amsterdam, there is a chance on Sunday 26th May.